Total Time : 80 Hours. 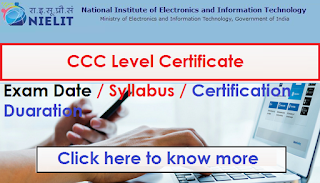 Examination Fee: The examination fee for CCC is Rs.500.00 + Service tax as applicable which is to be pay online through NEFT/RTGS/CSC-SPV/Online(Credit Card/Debit Card/Net Banking) while filling up the online examination form. Select Course 'Course on Computer Concepts (CCC)' shown on home page. correspondence. In case you provide wrong/incorrect mobile phone number you will not be able to receive the updates. Impression); all in .JPEG format, size limited to 50 KB each.